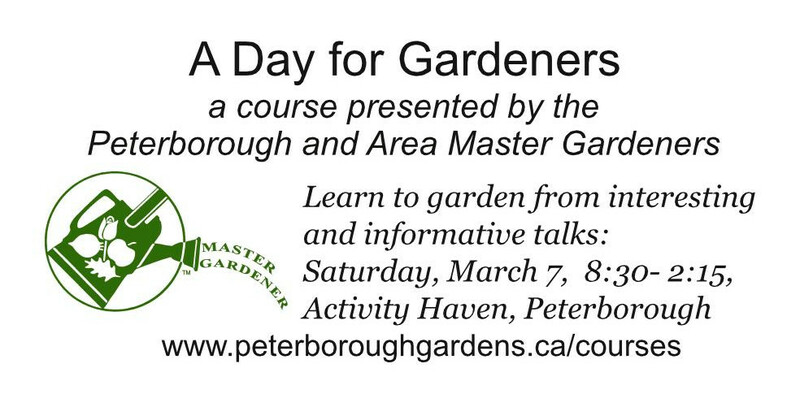 We have combined the resources of the Peterborough Horticultural Society, the Peterborough and Area Master Gardeners and the annual Peterborough Garden Show to provide a comprehensive source of information for gardeners. The Master Gardeners are presenting a new course. Come and join us for a day of gardening information. Find more about it here>. With gardening articles and links to external resources, you will find any information you need to garden in our area. Included are local events and ways to meet other gardeners. If you are interested in learning more about gardening and share this knowledge with others as a volunteer, you might like to become a Master Gardener. You can contact the Coordinator by email. If you have a question about gardening and cannot find the answer on our site, ask the Master Gardeners. It was a great party. More than 8000 people enjoyed the best show ever. The Peterborough Horticultural Society and the Peterborough Master Gardeners are proud to again present expert speakers, informative demonstrations and many exciting exhibitors. Come and get practical garden advice, see new plants and trends and get much needed head start on spring. Your attendance helps us fulfill our goals of protecting and improving the community environment and supporting local students in their horticultural studies. We are just about ready for the 2015 show on April 2, 3, and 4, 2015. This year to help with parking, we are providing free parking and free bus shuttle from the Kinsmen Centre. See the map for directions. Growing Your own Food is rewarding. Check out our advice. The Horticulural Society meets on the 4th Wednesday of the month except for July, August and December. We welcome new members. Just show up to a meeting and try us out, or fill out our registration form and mail it in. In addition to entertaining speakers and the company of other gardeners, you will have access to an extensive lending library, workshops and bus tours.